Royal Wedding: Middletons' money - how was it made? They're getting a coat of arms? A present from the Queen I assume. So what do the colors and symbols stand for in terms of Heraldry? I'm not up on all that. It does look like a present with that blue ribbon above...Why would they need a coat of arms? Well now her uncle can have it tatooed on his person somewhere, but it'll have to be where it gets noticed. Got, is there no end to this. Still .... NONE of them will ever, ever had the dignity and charisma of our Queen and her mother. Reckon this fiasco really IS the end of the monarchy ....... and I mean THE MONARCH .. not the hangers on (of which this woman will make sure she becomes a member). Sad. Oh yuck. If anything brings out the anti-royalist in me it's this kind of nonsense. What a bunch of social clilmbers and snobs they sound. They've connived their way in. This is so ironic, just like Pride & Prejudice!! So England and so out of date. If Kate prides herself as some hitory of art student and supposed to be some elegant sophisticated posh girl, this is the best she can come up with her design inputs? How revealing this is, the Middletons have made a joke of themselves and the royals do not look any better. By marrying the Middletons, it reflects on William, showing an orphaned son at a young age, got snared by a sensible cunning girl, who both mothers him and romance him... then her family replaces his own, becomes his surogate family... and now this. Poor Chap! It makes you realise just how modest and self-effacing some previous commoner families have been who have have had sons or daughters marry into the Royal family. Mr and Mrs Phillips, the parents of Mark Phillips, kept out of the limelight when their son married Princess Anne; I can't remember anything much about the parents of the lovely Sophie who married Prince Edward. Although Major Ron Ferguson, father of Sarah, was often in the news, he wasn't trying to cash-in like the Middletons. As far as I am concerned the Middletons aren't merely obsessive and grasping social climbers, but obsessive and grasping social mountaineers. And for all those who can't bear to hear the hard-working, self-made millionaire Middletons defamed, please wake up. While it's true they've made their fortune through their business, it's also true that 1) they were able to get their children into the 'right circles' because the money inherited through Middleton's Lupton family relations (seems, according to Channel 4, that none of the other Luptons benefitted from this) allowed pushy Carole to get them into places like Marlborough with old money students and 2) they have used the money earned from this business to sponsor an 'aristocratic' lifestyle for their children, i.e., instead of instilling a work ethic in them, they have pushed them to act as if they are nobility living off trust funds and inherited wealth ... nothing noble or exemplary in that. 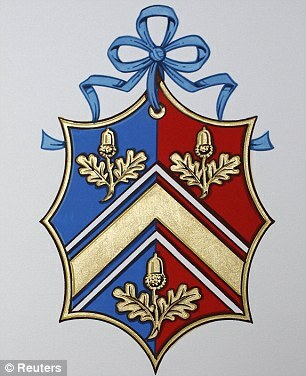 So what is next, after this coat of arms, buy Camilla's old manor house where Charles had his noctunal visit? I guess they will need something grander to entertain the in-laws where the in-laws will feel right at home? The Middletons, together with William is turning the monarchy into a farce/circus/joke. We here in Yorksire, poor relatives of both Michael and Carol are not invited to the wedding, and they stay away from us as much as possible. But those fancy double barrel names or those on Mustique, people they had nothing/luttle to do with the Middletons are getting invitations, so they can show the world how well connected they are and how rich they are. The truth is that Uncle Gary was in drug deals, and has paid for their lifestyel and kids education!! This marriage even makes Camilla look "respectable". Will is damaging the monarchy by marrying this Kate and the Middletons, and he has vowed to keep his future in-laws close and visible in his public life!? How low can we get??? With just nine days to go until the big day at Westminster Abbey, Queen Elizabeth hosted a lunch for Kate Middleton’s parents Wednesday – marking the first time Prince William’s future in-laws have met the monarch. 9 days to go! I'm getting excited! emm -- watching all the coverage is going to be nuts!!! i've got my show but then all the others -- i'm going to be channel surfing like crazy!!! Miss Middleton needs a coat of arms so that it may be impaled with that of her husband upon their marriage. The Middleton family left London's Goring hotel on Saturday morning a day after their eldest daughter Kate married Prince William. The royal bride's family, including sister Pippa, brother James and parents Mike and Carole posed briefly for photographs. Pippa, Kate's sister looked rested despite the late night wedding party held the night before for 300 wedding guests. Mr Middleton told the crowd gathered outside the hotel "We had a wonderful time." But Pippa ignored questions about what she thought of Prince William's brother Harry. Rich, privileged and fiercely loyal, they have been dubbed the Pipparettes – the closest friends and confidantes of Pippa Middleton, playing a crucial supporting role as she adjusts to life at the top of the worldwide celebrity A-list. Alice St John Webster and Camilla Campion-Awwad are the new leading lights of the Chelsea set – and they’re never far from their best friend’s side. As the younger Middleton sister hooks a Duke-to-be, Bryony Gordon asks whether Pippa has bagged an even better prospect than her newlywed sibling. One wonders if the Middleton family anthem goes something along the lines of “Anything you can do, I can do better, I can do anything better than you.” Before the royal wedding, it didn’t seem possible that anybody could outshine Kate Middleton – fabulous, beautiful Kate with her lovely glossy hair and dazzling smile. But then there was Pippa. Fabulous, beautiful Pippa with her lovely glossy hair, dazzling smile, and shapely bottom, eclipsing the bride on her wedding day. The comments under the article are much better than the article itself. According to this article " Pippa continues to embarrass Kate".